The Schuylkill Trail at Schuylkill Banks is a multi-use recreational trail extending along the east bank of the Schuylkill from the Fairmount Water Works, a national historic site, to Locust Street in the city of Philadelphia. The trail lies within a greenway of variable width (20 feet to 120 feet) and provides access to the Schuylkill River and riverbank along a section of river that had been previously inaccessible. The Schuylkill Trail at Schuylkill Banks is an urban trail paralleling the active tracks of the CSX Railroad. It is located adjacent to the Logan Square and Fitler Square neighborhoods, which form a portion of Center City Philadelphia. The trail, approximately 1.2 miles in length, has become heavily used with an average of 14,000 user trips per week (a user trip is one person passing a cordon line in either direction). It accommodates workers, runners, bicyclists, in-line skaters, commuters and people heading for a destination or event at or along the greenway (concert, movie, kayak tour, riverboat cruise, etc.). The greenway includes suitable park furniture (benches, trash receptacles, etc.) and is planted with a well designed palette of trees, shrubs and ground cover. The greenway and trail is a part of the Fairmount Park System and is managed by the Schuylkill River Development Corporation, a non-profit corporation whose mission is to revitalize the tidal Schuylkill River. Schuylkill River Falls at the Fairmount Dam opposite the Fairmount Water Works. Photo by michaelwm25. 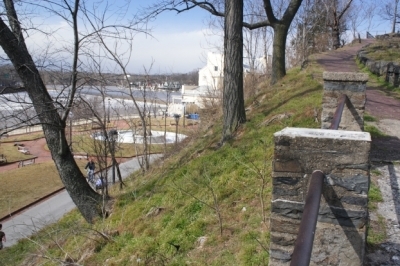 The Schuylkill River Trail, a multi-use landscape trail built as part of the Schuylkill Banks improvement project. Photo by Jeffrey M. Vinocur.